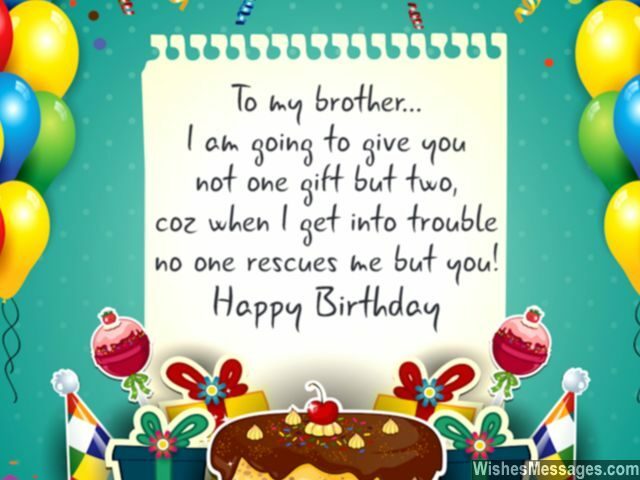 Birthday Wishes for Brother: Seize your brother’s birthday as an opportunity to say something sweet to him. Write a personalized message on a greeting card, send him a cute text, share a few quotes on Pinterest or post something funny on his Facebook. Empty those pockets and buy a nice gift for him too. The bond between brothers and sisters is unlike any other. It is an unspoken love, far greater than any other friendship or relationship. This is an attachment that stays strong despite fights, arguments and sibling rivalry. Most people don’t realize this until they are mature enough to look back at their teens and see how amazing it was to have a brother to grow up with. Whether you have a naughty little younger brother who steals your stuff or an elder bro who you hate right now – don’t let this unique bond rot away. 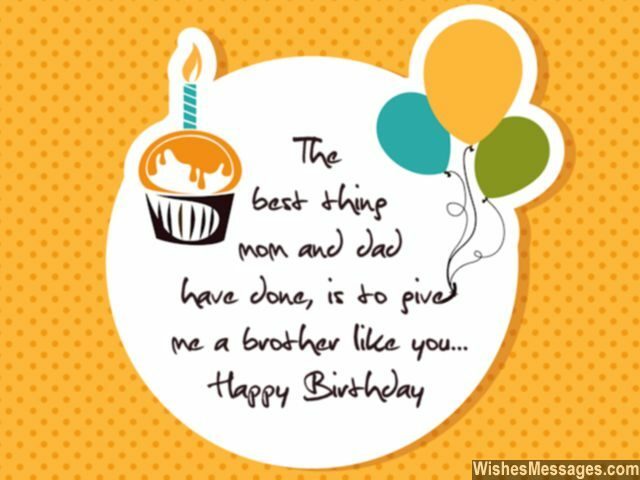 6) The best thing mom and dad have done is to give me a brother like you. Happy birthday. 9) Even though we both are total opposites, I have always loved you to bits. Happy birthday bro. 10) I should call you The Wall, because you support me and help me stand tall. Happy birthday bro. 11) Bro, no matter what life throws at us, I’ve always got your back. Happy birthday bro. 12) Other kids look up to Superman, Batman and Spider-Man. I don’t need to look at a man flying in the sky, a capped crusader zipping along the streets or a guy jumping from one building to another. I just look up to you, my brother. Happy birthday to my superhero. 13) From the time we played G.I. Joe to the time you taught me how to build Lego, you have been the best brother ever, is what I want you to know. Happy birthday. 14) All my life I’ve been chasing happiness. Little did I know that I was drenched in it, through all the years of childhood that I spent with you. Happy birthday bro. 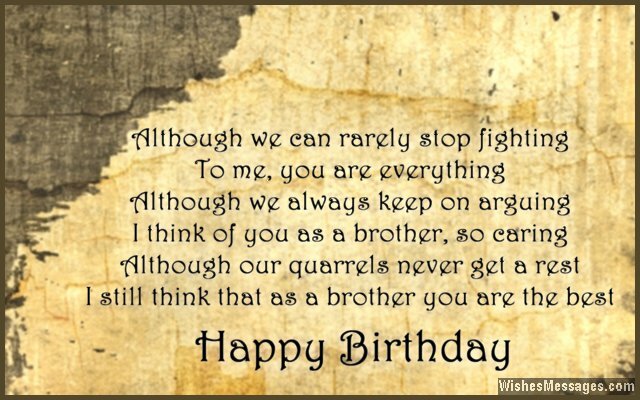 15) On my brother’s birthday I am making a wish, that we always remain inseparable like water and fish. Happy birthday. 16) We were born into this world in the same family – and I would not have it any other way. Happy birthday. 17) I am going to request my bank for a bigger locker so I can stow away my biggest asset – which is YOU. Happy birthday bro. 18) Your job profile as a brother is to love me no matter what troubles I get into. I want to congratulate you because you are doing a great job. Happy birthday. 19) You are the one who has taught me never to quit, by taking on life’s troubles with humor and wit. Having you around is such a delight, you light up my days and make everything seem bright. Happy birthday bro. 20) I always keep saying that you and I are totally different individuals. But the bottom of my heart knows that we couldn’t be more similar. Happy birthday bro. 21) I am going to give you not one gift but two, because when I get into trouble no one rescues me but you. 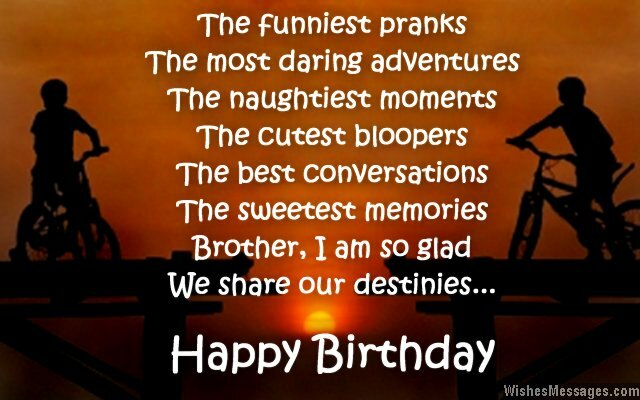 Happy birthday bro. 22) Brothers like you, make up for a million friends, old and new. Happy birthday. 23) What would I have done without your help, grade after grade. Without you by my side, I would have lost my way and strayed. Happy birthday bro. 24) Since the day I held you in my arms I always knew, there could be no one more special for me than you. Happy birthday to my baby bro. 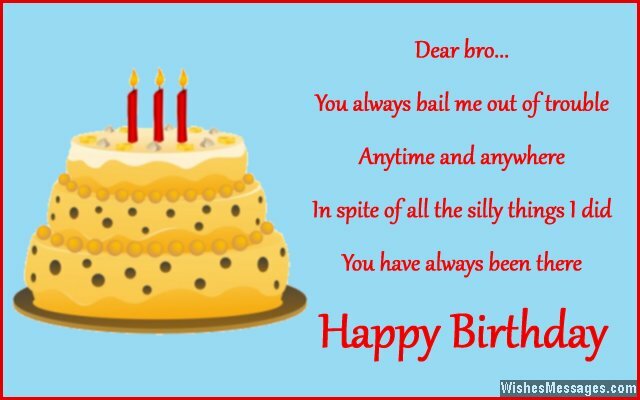 25) On your birthday let’s celebrate our brotherhood. Let’s once again, promise to stand up for each other in the future like we have always stood. Happy birthday bro. 26) The funniest pranks, the most daring adventures. The naughtiest moments, the cutest bloopers. The best conversations, the sweetest memories – bro, I am so glad we share our destinies. Happy birthday. 27) You are a brother, unlike another. You are my best friend, my loyal supporter. You help me deal with peer pressure, you reassure me when I can’t keep it together. You inspire me every day to be better, my debt for you will get over never. Happy birthday. 28) Throughout my childhood, you have been the ideal brother by teaching me new things. Your presence in my life is why I have finally got wings. Happy birthday. 29) Whoever said that food, shelter and clothing are all a man needs to survive, obviously never had a brother like you. Happy birthday bro. 30) Having you around is so awesome, that even being grounded doesn’t feel burdensome. Happy birthday. 31) Although we can rarely stop fighting, to me you are everything. 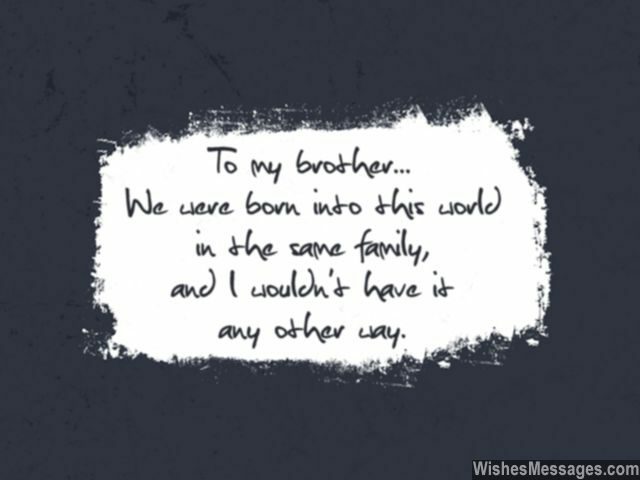 Although we always keep on arguing, I think of you as a brother so caring. Although our quarrels never get a rest, I still think that as a brother you are the best. Happy birthday. 32) I don’t look up to you because you are a brother who demands respect. I look up to you because you are a brother who deserves it. Happy birthday. 33) My best friends are at a loss because I expect so much out of them. That is because you have set a very high benchmark. Happy birthday bro. 34) Thanks for being my lifelong supporter, thanks for being such an amazing brother. Thanks for helping me out in each and every way, I hope you have a fantastic day. Happy birthday. 35) The best part of having a naughty brother like you, is that I can blame you for almost everything I do. Happy birthday bro. 36) You always bail me out of trouble, anytime and anywhere. In spite of all the silly things I did, you have always been there. Happy birthday bro. 37) My strength does not come from having tons of friends or a cool set of wheels. My strength comes from a brother like you, who supports me like a pillar of steel. Happy birthday bro. 38) You are the person who I have bugged the most. But I have made it up by making you the person who I have also hugged the most. 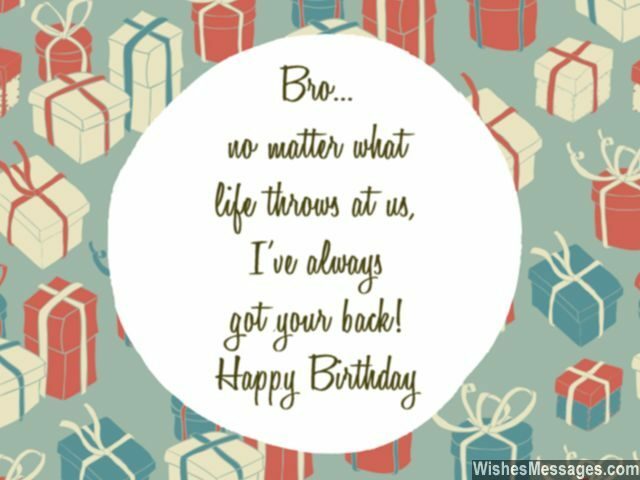 Happy birthday bro. 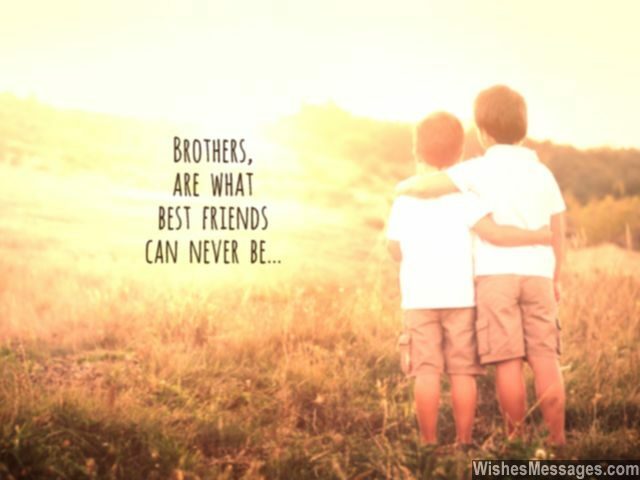 39) You are the best brother not for now, not for today, not for tomorrow – but forever. Happy birthday. 40) Despite all our quarrels and fights I confess that having you as my brother, is a very comforting feeling like no other. Happy birthday.